I have been loving my quinoa situation recently. Quinoa seeds are referred to as “grains” (even on the package!) which pretty ridiculous. They are technically a seed. Quinoa is a very malleable ingredient, and likes to take on the flavors of whatever else you put with it. It is high in protein, and tastes super yummy if you ask me. I created this recipe after finding a few quinoa salad options online. Ingredients: 2 cups quinoa, 3 1/2 cups chicken or veg. 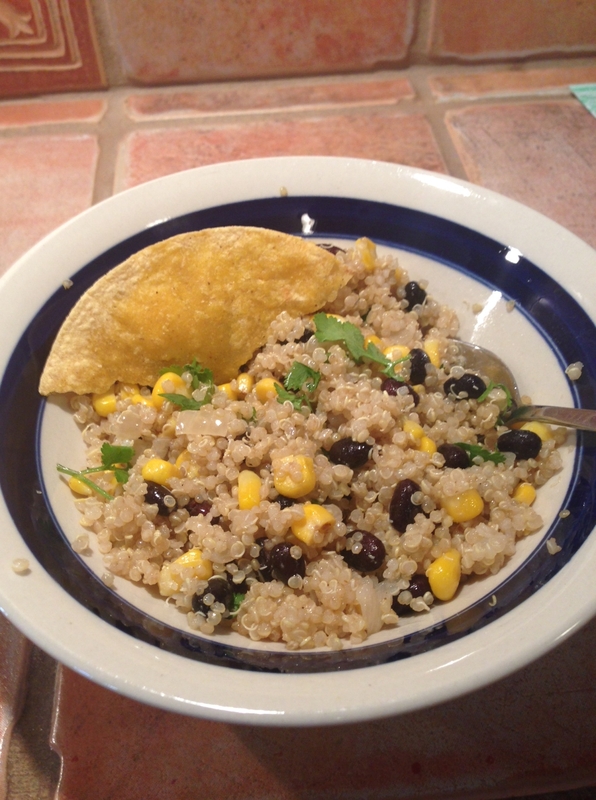 broth, 1/2 chopped onion, 1 can drained black beans, 1 cup of corn, 1/2 bunch chopped cilantro, 1-3 tbsp. cumin, juice of 1-2 fresh limes, 4 or so tbsp. olive oil, salt and pepper to taste. Directions: Cook onion with a little olive oil until onions turn translucent (5 mins or so.) Then toss in quinoa and stir with onions for a few minutes before adding broth. Then follow package instructions but modify the liquid quantity (they always call for 2 parts water per 1 part quinoa but this will be mushy.) After quinoa chills add the other ingredients. Serve with tortilla chips if you like. Oh! We sometimes add fresh avocado too… delish! Tips: If you make a large amount, just add the avocado when served or it will turn brown and you will make a bad face when you see it later. Some of the ingredient quantities are broad, above. This is because it really can vary depending on how much juice you get from a lime or how much you like cumin. I love the cumin/lime combo, so I go heavy on it. But you do what you like and I won’t judge. OK. So seriously: how beautiful is this salad!? I LOVE this photo. 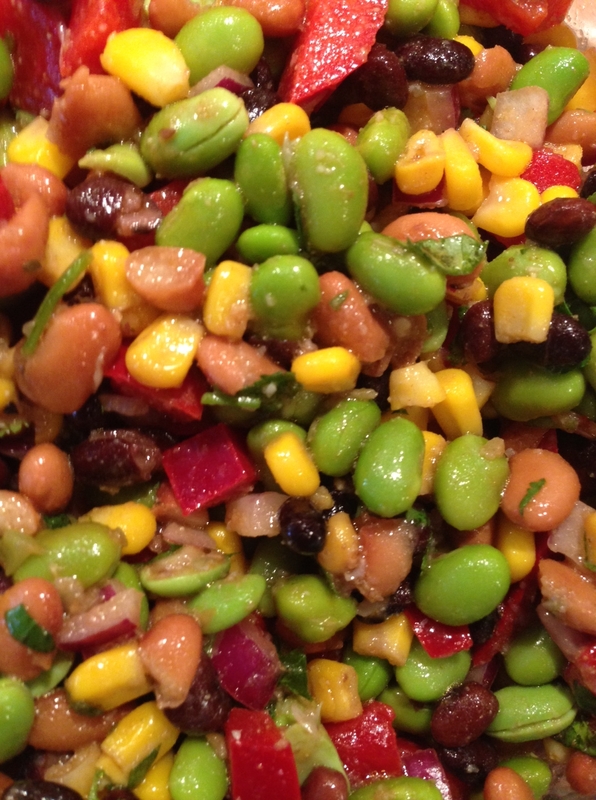 Texas caviar, as it is called, has been around for a while. I’ve had it before . Actually my friend Shandy makes a mean one and she sent me the recipe but I couldn’t find the dang thing so I got on line and found multiple methods of creating this delicious, nutritious, gorgeous–and VEGAN– salad. Ingredients: 1 cup of shelled and cooked edamame, 1 cup cooked corn, 1 can black beans drained, one can pinto beans drained and rinsed, 1 diced bell pepper, 1/4 cup diced red onion (I soaked mine in ice water for 5 minutes to take the “bite” out), juice of one fresh lime (ream that little guy and get every last drop out! ), 3 tbsp. olive oil, 1-2 tbsp white wine vinegar, 1 tbsp. cumin, dash of sugar, salt and pepper to taste. Directions: mix it up and eat it! Tips: The key to the flavor situation is the lime juice and cumin. LOVE that combo. Depending on how much juice you get from your lime–and then how much flavor that juice has–you may need more or less vinegar. Other ingredients that I could have also added include, but are certainly not limited to: cucumber, jicama, tomatoes, diced carrots–heck the list goes on and one. I will try to get some jicama in there next time as it seems like it’d soak up all those flavors real nice. Acknowledgement: pretty much every recipe for Texas Caviar that I found that was actually made by what appeared to be a real Texan contained black eyed peas. Being a Minnesota transplant currently residing in Pasadena, CA, I, uh, didn’t have those on hand… sorry! Go Lone Star State!